World War II came to Arizona via two significant avenues: prisoner-of-war camps and military training bases. Notorious for its prisoners' attempted escape through the Faustball Tunnel, Papago POW Camp also had a dark reputation of violence among its prisoners. An unfortunate casualty was Werner Drechsler, who supplied German secrets to U.S. Navy authorities after his capture in 1943. Nazis held there labeled him a traitor and hanged him from a bathroom rafter. Controversy erupted over whether the killing was an act of war or murder, as well as the lack of protection Drechsler received for aiding in espionage. Ultimately, seven POWs were hanged for the crime. 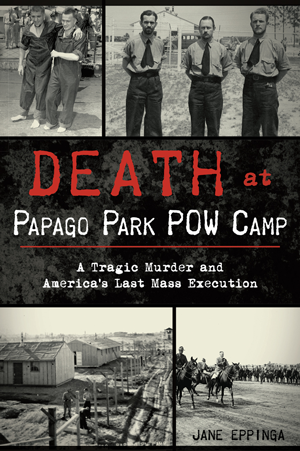 Author Jane Eppinga examines the tangled details and implications of America's last mass execution. Jane Eppinga is an award-winning author and historian living in Tucson, Arizona. The author of over a dozen books, her biography of Henry Ossian Flipper, West Point's first black graduate, was part of a package presented to President W.J. Clinton as a successful appeal to have Henry Ossian Flipper posthumously pardoned. She is a graduate of the University of Arizona. Learn more about Jane at www.desert-silhouettes.com.